Eating well at work has never been so easy or delicious, thanks to innovative employers like these. When it comes to work’s impact on healthy living, the associations tend to be negative: 60-hour workweeks that translate into 10-pound weight gains. End-of-day meetings that overtake your exercise hour and drain the energy you needed to make dinner. Team projects that push through lunch, leaving you with no other option at 3 p.m. than to scavenge snacks from the vending machine. But times are changing. Increasingly, employers are encouraging and rewarding healthy behaviors. Research shows that nearly 60 percent of all U.S. companies and 95 percent of larger companies offer some incentive to encourage employees to lead healthier lifestyles, says Jacqlynne Hart, president of HealthWealth, Inc., a wellness consulting company in Austin, Texas. Financially, it makes sense: annually, obesity costs American businesses $13 billion (in health insurance, sick leave, etc. ), and for every dollar a company invests into wellness programs, it saves an average of $3.14, according to one study. How are employers—all kinds, sizes, in various settings—helping their staffers to eat and live well? We wanted to know. To that end, we polled workplace-wellness experts, consulted our nutrition advisors and invited corporations to brag about their “delicious” benefits. We also asked you, our readers, to tell us about your own on-the-job environments. What we found: at worksites nationwide, there’s a healthy-eating revolution under way. We hope that these stories of creative solutions and great ideas will inspire you to initiate positive change in your own work world. Sometimes the best place to begin a major life change is the very place where you spend most of your waking hours: the workplace. That’s how it happened for Jan and David Blittersdorf, CEO and founder, respectively, of NRG Systems in Hinesburg, Vermont. After seeing their colleague John Miller lose more than 80 pounds by following an innovative weight-loss program, they decided to try it themselves—and transformed their own lives. Together they lost 135 pounds—and then committed to giving the same opportunities and support to their employees. NRG Systems, a top manufacturer of wind-measurement equipment for the energy industry, is truly a green company. Its standout building, surrounded by 15 solar tracker panels and a nearby wind turbine, uses one-quarter the energy of a conventional one. But the Blittersdorfs decided it could be even greener if they attended to the health of their employees much as they do to the health of the environment—two sides, in fact, of the same coin. Today, the results of that commitment can be found in every nook and cranny of the NRG building. Drop by at lunchtime and you may find people gathered to watch a local caterer preparing a healthy midday meal. Lunch—perhaps a hearty soup made from organic vegetables grown nearby, or a whole-grain pilaf—is on the house for all, with recipe and nutritional handouts to take home. (On another day, employees could be cooking up their own meals to share, in the fully equipped, spacious double kitchens.) Or, walk up to the third floor, where you might see someone swimming in the pool or working out in the fitness room—complete with showers and locker rooms, it’s available to employees 24/7. In summer, employees can sign up for the “bike to work” challenge, which rewards those who log the most miles with gift certificates to a local bike shop. But even if an employee doesn’t get involved in the healthy-eating, weight-loss and fitness benefits NRG offers, Jan Blittersdorf understands. “It took me over 10 years to finally decide to do something about my weight, so I don’t sweat it if we provide an opportunity and someone doesn’t take advantage of it. I now understand that they might eventually do it, and I won’t give up on them or pass judgment on them. Drop by one of the 12 cafeterias at the “Googleplex”—corporate headquarters of the technology giant in Mountain View, California, near San Jose—and you may experience flashbacks to your college days because the atmosphere is so vibrantly social, with “Googlers” buzzing from table to table, catching up with colleagues. The food, however, is far superior to anything you ate in university dining halls. Fresh sushi, roasted black bass with parsley pesto, Japanese udon noodle salad—that’s just the short list of meals that this Internet search-engine powerhouse (population: 10,678) offers its employees at no cost (yes, free). Best Lunch in Town? Sure, on-site cafés keep productivity high by eliminating the time it takes for employees to leave for lunch—but “Googlers” would be hard-pressed to find a more delicious and healthful meal “off campus.” Each café is manned by chefs who once donned toques at leading restaurants around the world. A nutritionist makes lunchroom rounds, answering questions about the nutritional values and origins of the dishes—many of which feature whole grains and several servings of vegetables. Farming in Work. This forward-thinking company is committed to supporting local growers. At Café 150, one of the on-site cafes, every ingredient used to prepare meals (except for the salt and coffee) comes from within a 150-mile radius of Mountain View. Every Thursday during the growing season, area farmers flock to the compound to sell their fruits and vegetables at the company’s exclusive farmer’s market—which makes it easy for busy employees to shop on site and head home with ingredients for healthy weekend meals. Convenient Stress-Busters. Recognizing that striking a balance between one’s work and personal life can be challenging, Google strives to help its employees simplify. Employees who choose to bike or jog to work can shower in on-site locker rooms. Four physicians offer free on-site consultations. In-house massage therapists provide subsidized relaxation (most massages cost $30 per hour). Google even helps eliminate the hassle of finding time for a haircut: twice a week, a van staffed with stylists sets up shop in the parking lot. Cost of a cut: a mere $18 for a snip. (Can’t beat that in the Bay Area!) “Our culture of innovation isn’t limited to technology,” says Sunny Gettinger, Google spokesperson. Supporting a healthy lifestyle comes naturally to Skimmer Hellier, owner of Stark Mountain, a custom woodworking company in New Haven, Vermont. Thanks to the influence of his wife Jill, who runs an organic farm in the area, Hellier believes strongly that “what we eat and where our food comes from manifests in how we feel.” And Hellier tries to extend this philosophy to his 12 employees by stocking the shop with local foods, such as apples from a nearby orchard and coffee from the Vermont Coffee Company. Be our “Guest” (Chef). When Hellier installed a kitchen in the woodworking shop two years ago, his intention wasn’t just to use it to showcase the cabinetry that Stark Mountain’s artisans finish to perfection. “I wanted a nice space where employees could enjoy their lunches,” he says. When friends and family stopped by to see the new space, “they’d say how much they’d love to cook in such a beautiful kitchen,” says Hellier. So now, about once a week, employees or their friends or family members use the kitchen to make a healthy lunch for the entire staff. (Hellier reimburses “chefs” for the ingredients.) Recent meals include Mediterranean orzo salad with feta vinaigrette and tomato and eggplant stew—with Blueberry & White Chocolate Chunk Ginger Cookies (an EatingWell recipe) for dessert. (Gentle) Pedal Pusher? In January 2006, Hellier launched a reward program: employees who biked 650 miles to and from work by the year’s end got a $1,000 bonus. (Those without a bike were given a $500 advance to buy one.) At the time Hellier announced the initiative, master woodworker Eric Albinson, 59, hadn’t been on two wheels in 45 years. Still, he seized the opportunity and used the advance to buy a new bike (as did nine of his co-workers who also didn’t have bikes—all employees participated). In the next 12 months, Albinson biked 700 miles to and from work and, in the process, saved $100 on gas and lost 50 pounds. Now, when weather permits, Albinson ventures off his “straight-shot” 3.5-mile (one-way) path to the shop and explores alternate—and often longer—routes. The extra mileage will help him to meet this year’s 750-mile bike-to-work goal, upped to keep employees feeling challenged. Class Acts. Organic Valley’s staffers can sign up for a wide range of cooking classes, which the company sponsors on site throughout the year. 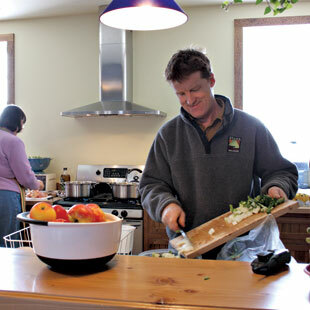 Taught by local food aficionados, the courses usually run four to six weeks and cover topics that include planning and preparing balanced organic meals, healthy eating for children and learning to read nutrition labels. Eating Well Made Easy. Organic Valley’s company café, The Milky Way, features a variety of healthful meals (and fresh breads) prepared from fresh organic ingredients—at very reasonable prices. “I usually spend $3 to $4 on lunch and I’ll have a salad with organic local vegetables and chicken in a citrus sauce,” says Aaron Miller, 31, the company’s event coordinator. Because the cafeteria enables him to make smart food choices without spending a fortune, healthful eating has become a no-brainer, says Miller. At many workplaces, competition between co-workers generally has to do with revenues and responsibilities—and mostly benefits the corporation’s bottom line. At Moen, a kitchen-and-bath-fixtures company in North Olmstead, Ohio, colleagues engage in contests that cultivate teamwork and support—and result in measurable health improvements for individual employees. Healthy For The Long Haul. Recognizing that most people don’t became overweight suddenly but gradually gain a few pounds each year, Moen’s Wellness Center sponsors “Maintain Don’t Gain,” a program that focuses on helping employees stay within two pounds of their current weights for the entire year. Employees who opt in to this program weigh in once a month at the Wellness Center. Those who hold steady at their January weights and work out three times a week through the year’s end win a sweatshirt. To further promote healthful habits, the Wellness Center offers “Lunch and Learn” seminars that cover nutrition basics and stress-management techniques. How big food-service companies are helping employees eat better. Microsoft is a global leader in the software business. Caterpillar is world-renowned for its construction equipment. Neither company specializes in food service and so, rather than trying to staff an in-house cafeteria, these companies—and thousands of others across the country—outsource their dining services to the pros. Three major food-service management companies—Compass Group, Sodexho and Aramark—hold a sizable share of the $2.4 billion U.S. corporate-dining business. And these industry leaders are enabling (and sometimes, encouraging) employers to provide more delicious, healthful and sustainably sourced foods to millions of American employees. Enticing Investments. A heightened attention to health alone doesn’t drive consumers to nutritious choices. “It used to be that when we offered lower-fat, lower-calorie foods, they sold poorly,” says Jenifer Bland-Campbell, R.D., senior director of nutrition program development for Aramark, which serves 1,300 corporate clients nationwide. “Now we can’t serve enough of them.” What changed? Recognizing that healthy foods won’t sell unless they taste good, food-service companies are partnering with top culinary institutions to amp up the appeal of healthy options. The chefs at Compass Group’s more than 8,000 corporate clients complete a 10-unit nutrition and healthy-cooking techniques course that the company developed with Farmingham State College. Sodexho and Aramark’s chefs go through similar programs created with the Culinary Institute of America. The focus isn’t on tinkering with employee café stand-bys (e.g., burgers and dogs) to reduce fat and calories but rather on enticing consumers with “inherently healthier ethnic cuisines, such as Pan-Asian or Mediterranean,” says Doug Warner of Aramark. “These cuisines have bold flavors that deliver big punches without the burden of heavy sauces.” Think: Vietnamese Rice Noodle Salad, with green chiles and lime juice. Sustainable Support. Food-service groups’ purchasing power may impact the sustainable and local food movements most of all. One example is Compass Group’s recent partnership with Monterey Bay Aquarium’s Seafood Watch, which is shifting the company’s seafood purchases away from threatened species. Already, the company has stopped buying eight types of endangered fish, including Atlantic cod (replacing it with Alaskan pollock and Pacific cod). Over three years, this initiative will result in more sustainable sourcing of 1 million pounds of fish. Food-service support of local agriculture goes a long way too. Last year, about 30 percent of one Compass Group division’s purchases came from within 150 miles of cafeterias where the food was served. Such purchasing decisions directed $55 million toward local farmers. In this situation, everyone wins: employees get fresher produce, farmers have more financial security—and we all benefit from the thousands of pounds of carbon dioxide emissions eliminated by reducing the distance food travels.